Marie and Eamon Molony tidy up outside their pub "Jacko's" on Bridge street Scariff where the footpaths have been left unfinished following digging in the area. Photograph by John Kelly. LOCALS in Scariff have said they feel their town has been “abandoned” by Clare County Council who they say “dug up the whole street” more than a year ago and “left it like a dangerous building site”. Scariff based publican, Eamon Moloney said “The people of Scariff have been long suffering. They dug up the whole street about two years ago [sic] to put down ESB cables and they just left it like a building site. It’s nothing better than a hard hat area. I’m just amazed how any town could be left like that for so long. How someone didn’t get seriously injured I don’t know. I don’t know how anybody could leave the main street in any town in the country in that condition is beyond me”. Mr Moloney who runs a pub on Bridge street said, while he understands the need to have to dig the paths up for necessary works, and that there was a certain level of acceptance that the street “might be in a mess for a while”. However, he said, “It is like they just abandoned us and we were the forgotten town. There are people who have stopped walking down to my business, people who have been coming here for 40 years haven’t been coming in because they are elderly people and they are just afraid to walk down because the footpaths are all uneven and are extremely dangerous. That’s how bad it is. I just want a footpath on my street. I want a bit of normality back. It’s been nothing short of a nightmare for the people who have to live and run businesses here”. Works on upgrading the footpaths in Scariff have been on hold as Irish Water had to carry out mains works in the town first. These works will start on January 21, however the delays came to a head on Monday at a public meeting hosted by local businesses and residents. At that meeting the business community and residents detailed that they are not happy that the paths up the hill of Scariff are to be finished in tarmac and want them to be reinstated with concrete. Former Clare TD, Michael McNamara attended Monday’s meeting and said, “The overall feeling was one of anger at the state of the street of Scariff. The footpaths were concrete. They want the new footpaths to be concrete and people are not happy with tarmacadam. Having gone through a year and a half of disruption people are not willing to accept a second best solution”. Mr McNamara added that it was pointed out at the meeting that in Feakle footpaths were recently replaced and they were replaced with concrete. “So if it was good enough for Feakle it should be good enough for Scariff,” he said. Mr McNamara said the meeting heard personal stories of elderly people being “unable to walk up the street of Scariff” because they were afraid of falling. 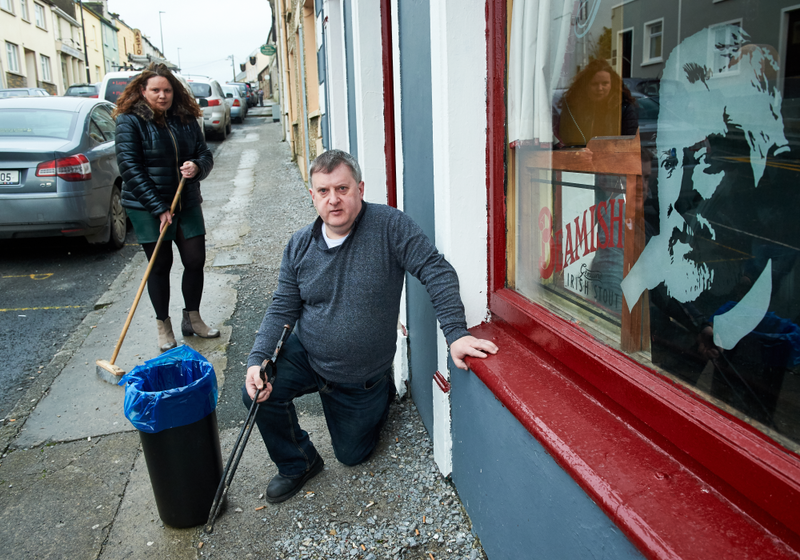 “I know of numerous people who have fallen on the street of Scariff and we’re lucky that this litigation culture, which we are constantly hearing is not happening in Scariff, because Clare County Council would be cleaned out if there were,” Mr Namara said. 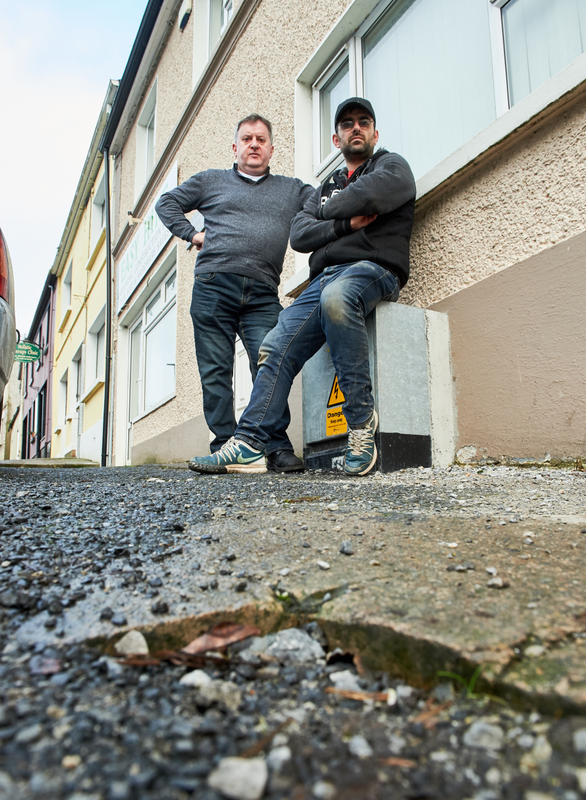 Eamon Moloney and Easy Hire shop owner David Scanlan on Bridge Street in Scariff where footpaths were left unfinished. Photo John Kelly. Local resident David Scanlan, who lives on Bridge Street said “It is going on so long now it’s a joke at this stage. A delay is a delay but when you are going into years it’s ridiculous”. As a parent he said the paths have been particularly challenging for those with young children also. “I have a two and a half year old and having the paths left like that with no definition between the path and the road is dangerous. It makes it awkward when using a buggy. For older people going up there night time it is hard to see where you are going, and you’d be afraid you’d be thrown upside down. On a few different occasions there have been holes. 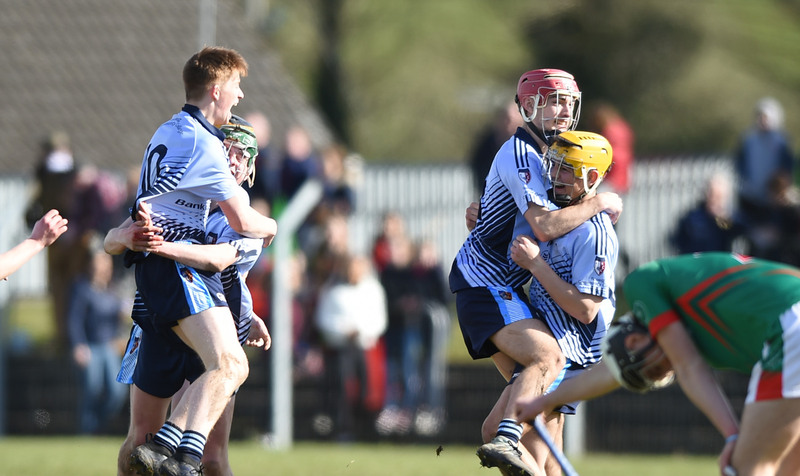 I’m from Scariff all my life, I haven’t been living here all my life, but I’ve never seen Scariff like this before, and as a resident it doesn’t leave a good taste,” he concluded. 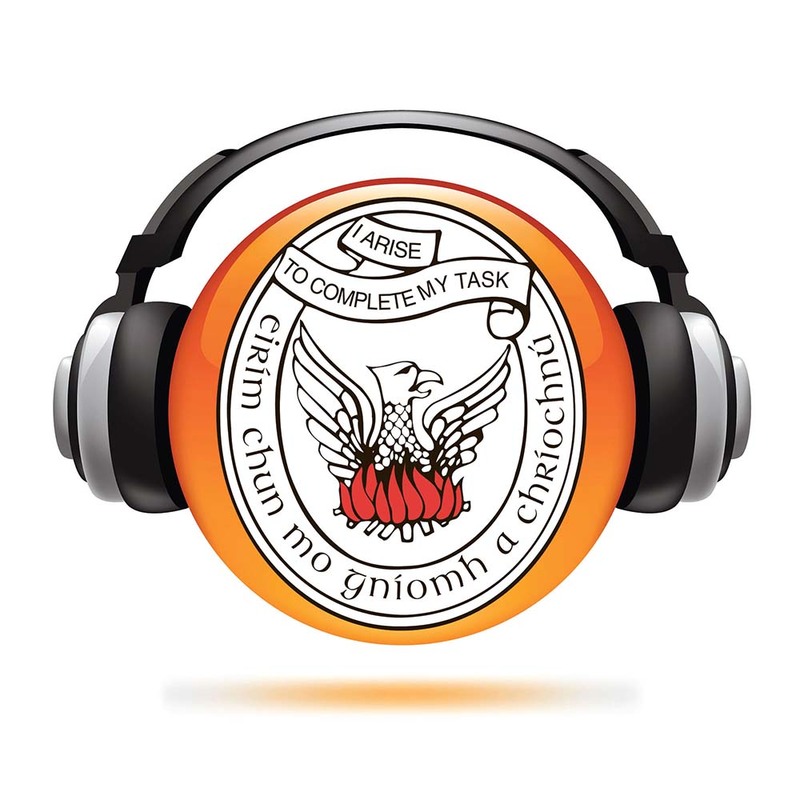 Clare County Council said funding for the footpath project was secured through the Town and Village Renewal scheme and that Scariff Community Council has been consulted throughout this project. Another point raised at the meeting had to do with trees being planted in the town. According to Mr McNamara this is “nonsense” as it is not in keeping with the town. He said locals are “deeply sceptical” about this idea as they believe it will have an impact on parking. Mr McNamara said, “Clare County Council have cut down practically every tree in East Clare, literally the hedgerows in East Clare have been destroyed. It looks as though an invading army has passed through and brought the firewood with them, it looks like Cromwell’s army have been through, it’s incredible. One of the attractions of East Clare was its beautiful hedgerows, and they are destroyed now for a generation, now having done that they want to impose trees on the streets of Scariff which historically never had trees. It’s a market town, it’s not in keeping with the architecture of the town. It’s nonsense”. Clare County Council said, “The design team were quite clear that no spaces were being lost from the number currently available. The design examined the number of parking spaces available and positioned the trees in locations unusable for parking. Following representations from Scarriff Community Council, a tree was removed from the design leaving 20 trees”.